PhotoLab Calendar is a must-have schedule management tool for anyone who has a photo or video business. It supports infinite number of resources (digital services, film services) and has a well-organized navigation system. It's perfect to plan working hours, keep track of scheduled appointments and orders. It'll store the information about clients, such as their address, telephone, email and comments. ...... view to help you get the general overview of the jobs. It's possible to create reminders to alert users about the things they should do. Available is an automatic search and auto-field filling for a client, who has already been entered to the database. You can view the information about payments, daily income for any day at any moment when you need it. For those people, who work in Microsoft Outlook, it's possible to synch data. Export of data is available to different formats: XLS, TXT, HTML, XML, PDF for its adaptation for other programs. In case of crashes or virus attacks, there is an auto backup function with a possibility to remove old archives automatically. 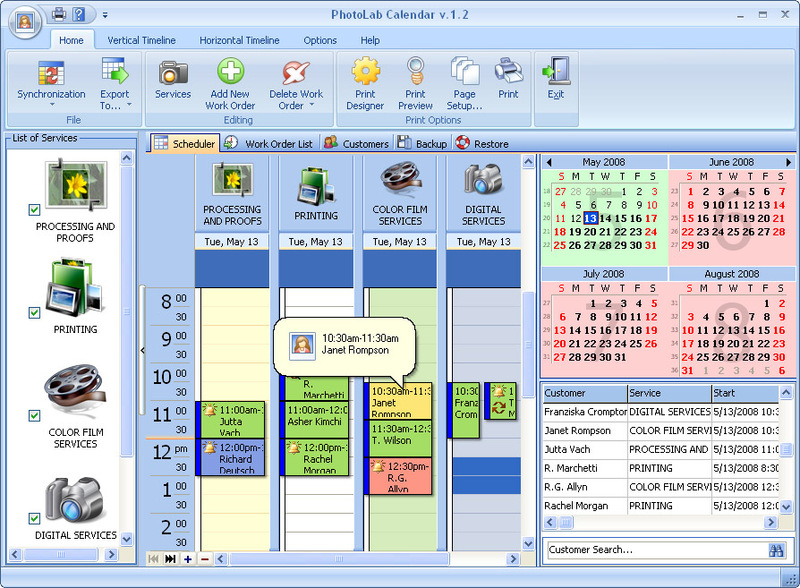 There is an inexpensive version of PhotoLab Calendar for workgroups, allowing unlimited number of users to work simultaneously over the network. You pay for the program only the first time and get all new versions of this program for FREE and for a lifetime! A must-have schedule management tool. Qweas is providing links to PhotoLab Calendar 3.1 as a courtesy, and makes no representations regarding PhotoLab Calendar or any other applications or any information related thereto. Any questions, complaints or claims regarding this application PhotoLab Calendar 3.1 must be directed to the appropriate software vendor. You may click the publisher link of PhotoLab Calendar on the top of this page to get more details about the vendor.